But September 5, 1932 brought the first day of the new school year, and a category 5 hurricane. 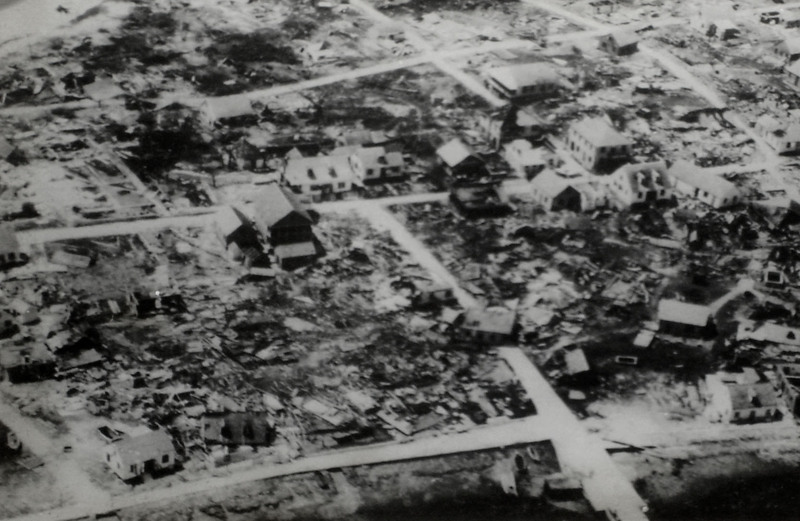 It destroyed most of the buildings on Green Turtle Cay, including the Curry family home. 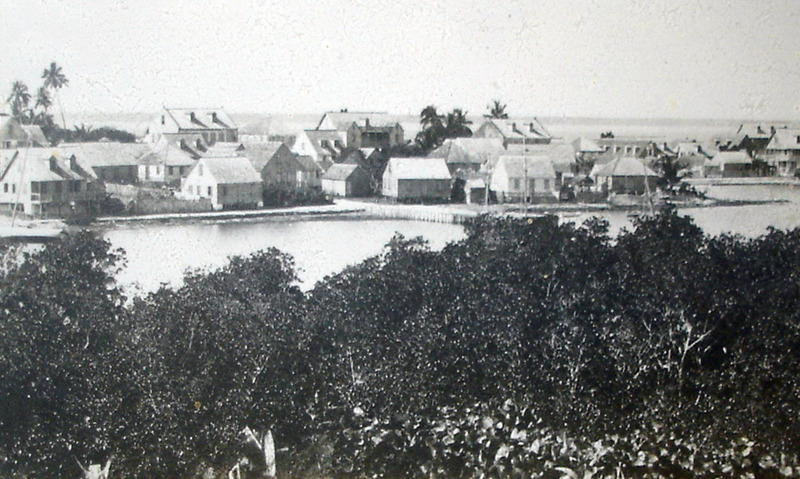 Green Turtle Cay after 1932 hurricane — Curry house is second from left at bottom of image. Herman and May were left to rebuild a house with nothing more than the materials they could salvage from the rubble. My grandmother remembered watching her mother pull on overalls and climb the steep roof to nail shingles. Even today, there are signs within the cottage of its humble heritage. The wall boards vary randomly in width and length. Strange notches in the kitchen ceiling beams serve no purpose in the current structure. And not surprisingly, the house is significantly smaller than its predecessor. Pa Herman passed away in 1958, and soon after, Ma May moved to Nassau to be near her daughters and grandchildren. After her death in 1984, the little house by the ferry sat empty most of the time and by the turn of the century, it was shuttered year-round. 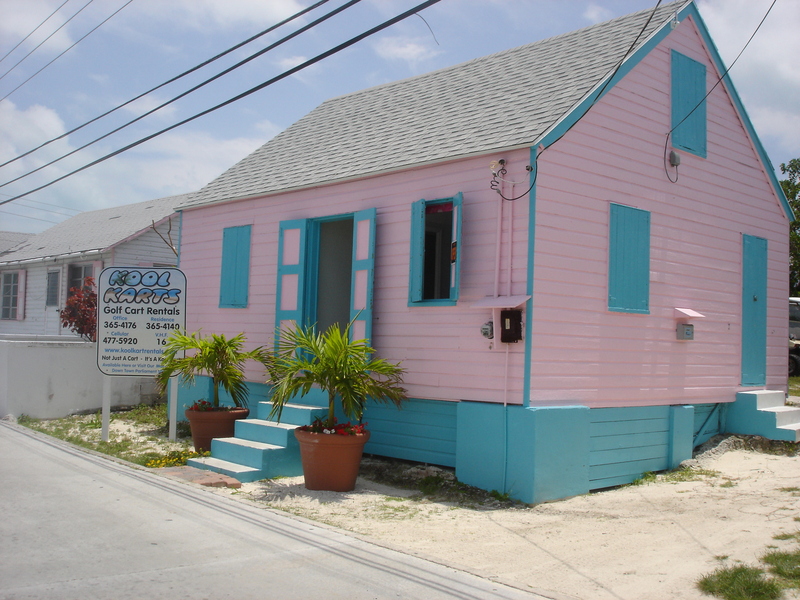 When I first brought Tom to Green Turtle Cay in 2005, the house was in disrepair. Its concrete footings were beginning to crumble, the paint had peeled, and without a protective coating, the wood siding was wearing away. A leaking roof had left the floors spongy and the interior walls water-stained. Tom and I offered to purchase the house and restore it, but as is often the case, the various relatives who owned the property had different ideas about what to do with it. That’s when our friends Mark and Caroljean Lowe stepped in to help. With the long-term fate of the house still up in the air, they offered to make some immediate repairs and protect it from further deterioration in the interim, while using it for their golf cart rental company – Kool Karts. We ‘ll always be grateful to Mark and Caroljean for seeing the cottage through those years of uncertainty. Finally, by 2012, the various family members were all in support of our offer to buy it, and Tom and I completed the purchase. We’re excited about continuing the restoration and returning the little cottage to the role of family home. Aside from the basics of modern comfort – electricity, water and air conditioning – our aim is to remain as true as possible to Pa Herman’s original construction. After hearing this story often enough, we found ourselves shortening it. When conversations about the house led to someone saying, “Oh, Miss May!”, we would just nod and ask, “Fish hooks?” It was only a matter of time before – so to speak – we got the point. And Fish Hooks it is. Our journey with the little house by the ferry officially begins next week with a home inspection that we hope will give us an understanding of the state of the structure. I’ll share our findings and plans in a future post. Related Posts: Fish Hooks Update – The Inspection, Attic Archaeology, And Then There Were These…, Fish Hooks Update, Fish Hooks Video Diary: A Solid Start, Fish Hooks Video Diary: The Cellar, Fish Hooks Video Diary: Beam It Up, Fish Hooks Video Diary: Ready, Set…, Fish Hooks Video Diary: The Move.